Capability Maturity Model Integration (CMMI) is a process level improvement training and appraisal program. Administered by the CMMI Institute, a subsidiary of ISACA, it was developed at Carnegie Mellon University (CMU). CMMI Maturity Level 3 is classified as “defined” which means that a company has established sets of defined and documented standard processes that are subject to some degree of improvement over time. These standard processes are in place and used to establish consistency of process performance across the organization. CMMi demands a lot of change management to be handled across organization and commitment from each stake holder in the organization. CMMI Model involves 22 processes. These 22 processes contains Technical processes Project management processes and organizational processes. Each CMMI level employs implementation of specific processes out of these 22 processes. As CMMI levels are increasing, process spread also increases which improves maturity level of the organization. The organization with CMM maturity level 3 means it has achieved all the specific and generic goals of the process areas assigned to maturity levels 2 and 3. In this level of maturity, processes are well characterized and understood, and are described at organization level. In CMMI, Assessment is conducted by team of Assessment Team Members (ATM members which involves the Lead Appraiser as Team Leader) whereas certifications are generally conducted by team Auditors and Lead Auditors. CMMI Assessments are based on the collective evidences conducted from available documentation (direct and indirect) and participant’s interviews (oral affirmations) whereas Certifications primarily are conducted to evaluate the activities (through inspections) and records (documents). CMMI Level 3 is based on process improvement guidelines and the company needs to implement 22 processes for CMMI certification as listed below. CDG Certification Limited is leading CMMI Certification, CMMI Consultancy & CMMI Appraisal company in India. Please contact us for all your requirements related to CMMI Certification. Backed with years of industry experience, we have been able to offer the finest collection of CMMI Level 3 Certification. CMMI Level 3 is achieved when an organization successfully completes SCAMPI An appraisal, which verifies that the organization is operating at Level 3. 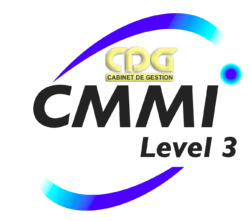 CMMI Level 3 is one of five “Maturity Levels” in the CMMI, Known as the “Defined” level, CMMI Level 3 is achieved when an organization successfully completes a SCAMPI A appraisal, which verifies that the organization is operating at Level 3. This means that organization’s engineering processes are defined for process areas such as Decision Analysis and Resolution, Integrated Project Management, Organizational Process Definition, Organizational Training, etc. Rating for Maturity Levels are awarded for levels 2 through 5. Note that the CMMI is not intended as a ranking system, however. The CMMI is a model that guides us on how to be a great products and engineering company. There is no inherent competitive advantage to being Maturity Level 5 (“Optimizing”), for example, instead of Maturity Level 2 (“Repeatable”) or 3. But there is tremendous value in being a better organization. At maturity level 3, an organization has achieved all the specific and generic goals of the process areas assigned to maturity levels 2 and 3. At maturity level 3, processes are well characterized and understood, and are described in standards, procedures, tools, and methods. A critical distinction between maturity level 2 and maturity level 3 is the scope of standards, process descriptions, and procedures. At maturity level 2, the standards, process descriptions, and procedures may be quite different in each specific instance of the process (for example, on a particular project). At maturity level 3, the standards, process descriptions, and procedures for a project are tailored from the organization's set of standard processes to suit a particular project or organizational unit. The organization's set of standard processes includes the processes addressed at maturity level 2 and maturity level 3. As a result, the processes that are performed across the organization are consistent except for the differences allowed by the tailoring guidelines. Another critical distinction is that at maturity level 3, processes are typically described in more detail and more rigorously than at maturity level 2. At maturity level 3, processes are managed more proactively using an understanding of the interrelationships of the process activities and detailed measures of the process, its work products, and its services. At maturity level 3, processes are well characterized and understood, and are described in standards, procedures, tools, and methods. The organization’s set of standard processes, which is the basis for maturity level 3, is established and is continuously improved over time. These standard processes are used to establish consistency across the organization. Projects establish their defined processes by tailoring the organization’s set of standard processes according to tailoring guidelines. CMMI Maturity Level 3 organizations have demonstrated that they are more productive, have fewer delivered defects, have lower risk for development, and more consistently meet cost and schedule objectives. 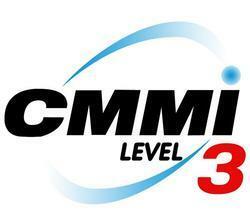 The CMMI Level 3 rating is a distinction that clearly demonstrates to our customers that we are fully committed to high-level process improvements that assure the delivery of superior product, system and service solutions. 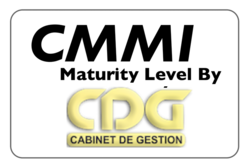 This maturity level is increasingly becoming a competitive differentiator on many government programs and is consistent with CDG’s culture of continuous improvement and commitment to excellence.